Unfortunately, at some point during the breed’s development, a spontaneous mutation in the ITGB2 gene occurred in a single Irish setter. 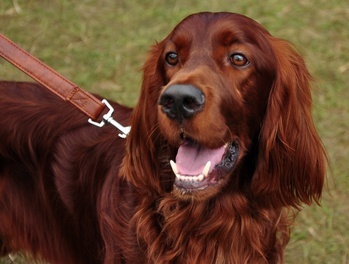 A portion of this dog’s offspring also inherited the gene and the mutation was spread far and wide throughout the Irish setter population as ancestors of these offspring became the future generations of breeding dogs. In 1999, the mutation of the ITGB2 gene was found to be the cause of a serious genetic disease of the Irish setter known as canine leukocyte adhesion deficiency type I (CLAD). CLAD has since been identified in the multiple varieties of the Irish setter suggesting that the original genetic mutation associated with CLAD occurred in an early common ancestor of current blood lines. Dogs affected with CLAD lack the ability to mount an adequate immune response to prevent infections. Affected dogs will show signs of infection shortly after birth and will display recurrent infections throughout their short life. Infections of multiple types are common and can be seen in the umbilicus, skin, urinary tract, oral cavity, and respiratory tract among other locations. Affected dogs often have enlarged lymph nodes and are of lower body weight than normal littermates. Even when treated chronically with antibiotic medications, dogs rarely live beyond 6 months of age. CLAD is a recessive genetic disease meaning that affected dogs must inherit two copies of the associated mutation (one from each parent) in order to develop the disease. Dogs only inheriting one copy of the mutation are considered carriers and do not show clinical signs of disease. However, if bred with another carrier of the CLAD mutation, the pairing can produce affected puppies. Due to their lack of clinical signs, these non-symptomatic carriers pose a significant problem for breeders trying to eliminate the disease from their breeding program. Luckily, genetic testing is available to identify carriers of the CLAD mutation prior to breeding. Carriers of the CLAD mutation can still be bred to dogs that did not inherit a copy of the mutation without fear of producing affected animals. However, 50% of the offspring from this pairing will be carriers of the mutation. As with all genetic diseases, breeding of affected dogs is not recommended. Paw Print Genetics offers testing for canine leukocyte adhesion deficiency type I and four other inherited diseases of the Irish setter and Irish red and white setter. If you’d like to discuss how to improve the genetic health of your breeding program or have questions about the genetic health of your Irish setter, feel free to contact us at AskUs@pawprintgenetics.com or call our knowledgeable and friendly staff at 509-483-5950.